What a difference a day makes! 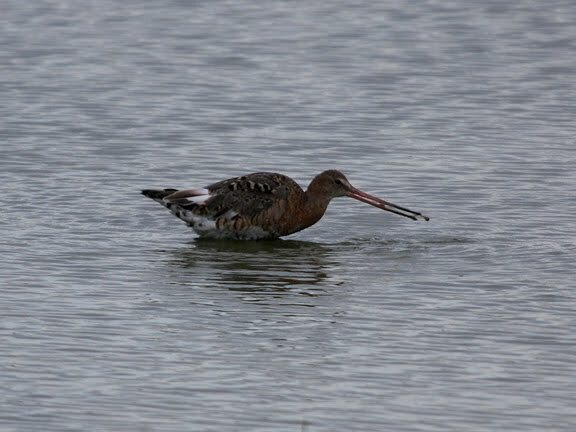 A little over 24 hours had passed since I had a tip-top trip to Gilroy Nature Park, picking up a new (to me at least) colour ringed Black-tailed Godwit in record time. Not so today. I recieve an update on numbers from a knowledgable source. Over 100 now! Still just the one ringed bird, but the increase in numbers is excellent news. Autumn passage is in full swing! Far too busy for a lunch-hour trip today so I'll have to wait until the working day is done. I load up the kit on my bike, the scope on top of the camera bag looks a little precarious, but is well strapped down. Off I go. Progress on the push-iron is not aided by a stiff northerly breeze but I console myself with the thought that it is helping the Blackwits drift in from Iceland. I arrive expectant of a century of Black-tails but I find only 24 none colour ringed. I later learn a raiding Sparrowhawk had put them to flight earlier. Not the birding bonanza I had hoped for! Yesterdays visit was too good to be true! Oh well, I'm not too down-hearted, there's always something to look at. 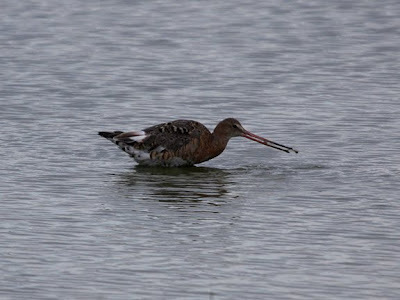 I start dividing the Godwits into adults and juveniles and this gives me a pleasant half hours birding. I notice that some of the adults seem to be moulting. I reckon they'll stick around for a bit so I'll be able to make a few more trips here. One individual is feeding close in and spending a while watching it I see it dispatch a couple of worms. I decide to deploy the camera and try and get a few feeding shots in the absence of colour rings. I think this individual is a moulting adult male from the black barring on the underparts and the strong colour on the neck and breast. From the patchy grey feathers on the face and the missing primary feathers I figure it's in moult. The juvs seem to be very heavily barred on the back with more white under the tail. Any comments on this are welcomed! There is a drop of muddy water running off the bill and in the high resolution image you can see a small invertebrate being drawn along the bill into the mouth, it looks like a dot on this smaller image. A rumbling stomach means it's time to pack up and pedal off, strangely the wind seems to be in my face on the way home as well as on the ride here. Sometimes it's just not your day! I'm a sucker for this though so I'll be back tomorrow!